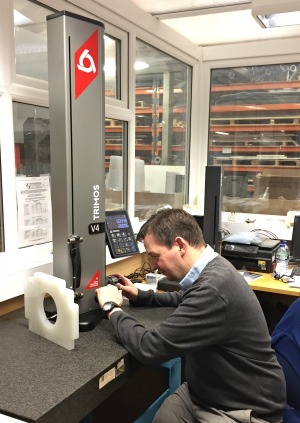 Bowers Group has supplied Sentinel Plastics Ltd with a Trimos V4 700 Height Gauge to maintain high levels of inspection accuracy for CNC machined plastic components. Based in Cradley Heath in the West Midlands, Sentinel Plastics Ltd is an engineering company specialising in CNC machining and fabrication of all types of industrial plastics. Manufactured to customer specification, Sentinel Plastics carries out CNC Machining including Routing, Milling, Turning and Bending producing varied components for diverse uses such as power control units within wind turbines. The Trimos V4 manual height gauge has a measuring range of up to 700m. Ideal for use in the workshop, the Trimos V4 is a robust, accurate and reliable height gauge. The functions on the display unit are directly accessible and depicted with easy to understand symbols, making the device easy and quick to use even by operators with no previous training. Software enables personnel to transfer data from the height gauge directly to inspection reports, ensuring accurate recording of all measurements at inspection stations throughout the business. First Article Inspection Reports can be easily generated, and handwritten recorded measurements can be bypassed completely, saving time and allowing operators to devote more time to the inspection process. The Trimos V4 height gauge enables Sentinel Plastics to quickly and accurately measure complex machined components, meeting a variety of measurement needs and improving its in process inspection procedures. Bowers Group also supplied the company with an XT3 Holematic pistol grip bore gauge set for measuring their internal diameters, and two Sylvac Hi-Cal 450 digital motorised height gauges for use on the shop floor. Sentinel Plastics Ltd Quality Manager Mark Rose said: “Following a generous grant from Wolverhampton University, we were able to buy the height gauges and bore gauges, which have been a significant step up in measurement capability for the business. Our inspection stations are now fully equipped, allowing us to take accurate measurements on the shop floor. The hand held bore gauges mean that operatives can take them directly to the machine and measure in situ, ensuring accuracy and saving time. The convenience of measuring components on the shop floor rather than having to move from the workstations to the inspection room saves time and makes people’s jobs easier. It also gives our operators confidence that the parts they manufacture are precise and accurate. With high quality standards at the forefront of the business, Sentinel Plastics Ltd has always had exceptionally high standards regarding the accuracy and finish of manufactured components. The company has a tightly controlled production and quality data base in which each process of manufacture and inspection is updated constantly using strategically placed process recording stations around the shop floor. Founded in 1989, Sentinel Plastics Ltd has developed significantly in recent years by manufacturing components for the renewables industry, with customers including world leading power generation company GE Power. The company also manufacture components for the oil and gas industry which requires assurances of tight tolerances. Continued investment in several CNC machines has enabled Sentinel Plastics to take on more work manufacturing complex components, which require the highest levels of quality and finish. The company was, therefore, looking for ways to improve accountability and accuracy in its process recording, and improve its inspection equipment to meet tighter tolerances for increasingly complex parts. For more information on Trimos height gauges available from Bowers, click here.